Meet the horses of Heavenwood Farm! We take pride in the quality of horses available to learn on here at our farm. We have spent a great deal of time searching for nice horses that compliment our lesson program and help our students learn and grow in their riding. We hope you will fall in love with them just as we have! Mickey is a 17 y/o Appendix QH who is the biggest building block in our lesson program. He is kind and gentle and slow with the beginners but picks up for more advanced students. He is just an all around good guy! Marshall is a 17 y/o Miniature Horse who is the perfect size for our miniature riders. He carries kids under 80 lbs. and even pulls a cart. He is just a fun sized guy! 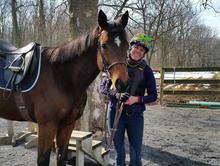 Ridge is a 12 y/o Thoroughbred who is co-owned by Heavenwood and Diane Wilkison. He is a nice all around horse who we use for intermediate and advanced riders. He was trained for steeplechase racing so his favorite activity is jumping. He is the ham of the barn! Roscoe is a 9 y/o Quarter Pony who has a huge personality but shows great talent when put to good use. Roscoe is currently living in Iowa with Nicole, the first student to ride with us at Heavenwood when our program started up. He is doing well there having a job and individualized attention. We always look forward to his adventure updates on our Facebook page! High quality and safe horses are our top priority. 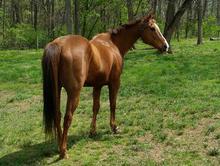 Scoop is a 17 y/o Quarter Horse who is actually a retired racehorse. We've fallen in love with this gentle soul and his sweet face! He is part of our beginner and intermediate program because of his patient and gentle nature and his slow way of going. Although he may be a little lazy, he is quite the fancy mover! Bash is a 16 y/o Thoroughbred who we bought in February 2015. He is a gentle soul and is showing his talent at jumping and is a true pleasure to trail ride. He is forgiving, but also sensitive and he loves attention and treats. He has been a wonderful addition to our program! Charm is a 16 y/o Thoroughbred owned by Ann K. We picked him up at the racetrack in 2007 and he's been at our farm pretty much ever since. Ann had been half-leasing him for a couple of years and when she decided that she wanted to buy a horse, it just had to be him. They are a perfect pair and have a great partnership! We are so happy that Charm is so loved! Cioppino is a 6 y/o Thoroughbred owned by Jenna R. Jenna and Cioppino have been together a year and have made a lot of progress in their training and have started to build a great partnership. Cioppino is a smart guy with a good nature and seems like he will be a good all around horse once he gets the hang of life off of the racetrack.